Replies: 1242 (Who? ), Viewed: 120044 times. OK, as promised before I went to bed, I'm looking further into what we'd need to batch-generate in order to give multiple color options to all objects. What we got working earlier today was to clone and modify GMND for the object, and to generate a new MMAT for it, both to be stored in different .package files. I'm having a look at different kinds of objects now which have only one texture, looking for what is the same and what is different, learning the naming convention used and so on. My latest tidbit is that the GMND we cloned for the painting... the one called *_tslocator_gmnd, where normally the multiple texture blocks are stored it seems... does not exist for all objects.There are other GMNDs for the objects, but it doesn't appear that ANY specific type of GMND exists uniformly for every objects. I'm just about to test adding the blocks to a GMND of the type *_root_rot_gmnd to see if the program will recognize them in there. Last edited by rentechd : 20th Jan 2005 at 12:08 AM. The 2 cDataListExtension Blocks can be added to any version of GMND. Many objects have more than one GMND, so our batch process have to make sure to add it only to one instance. The blocks must go at the beginning of the file, it seems... immeditately after the cGeometryNode. I tried moving them to end of the file, and it didn't work. It doesn't appear to matter which of the 2 blocks comes first. the answers may be in Shape files. Edited to Add: Of course we need NOT include the MATDs for groundshadow and Null references in all of the above. Last edited by RGiles : 14th Dec 2004 at 1:12 PM. Right. I wouldn't want 500 staircases to sort through, all marked as custom content, and all with great big package files because they must contain EVERYTHING that referes to those stairs. Actually you've hit on a good one for me to test with. Those stairs. What I'm looking for now are objects in the catalog with only one color option that appear to have different textures in different places. A dead givaway would be if one part of that object is glass or shiney and another part is not. So those stairs are a good one. I'm testing the sunflower plant right now, as it also has 2 different materials. The pattern I described above seems to hold true for all objects, at least all of the random objects I've tested it on. It hold true for models with different MATD applied to different parts. 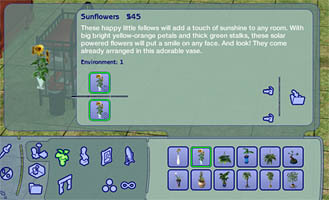 In the image attached, there is an option for different flower colors and one for different vase colors. If this batch generation is something that Quaxi decides to work on, I would recommend this... that rather than make it a public feature of SimPE, just add it to a tester's version, generate ONE set of these files, and then we'll beta test the hell out of, make sure it's not broken on any of the objects, edit by hand or remove GMND overwrite instances that DO cause problems, and then release that set of packages rather than the tool to create it with. Cause no one needs more than one copy of these packages. Better that they download a fully tested version of it. I'm so tired. I only slept about 2-3 hours this morning. I think I'm going to go to bed. Last edited by RGiles : 14th Dec 2004 at 1:14 PM. It wasn't for nothing! I for one appreciate the effort. Sometimes you just have to bang your head against a wall for several hours or days for a light bulb to finally go off. You tried and it's certainly better than not trying! Get some rest and don't worry about it for the rest of the night. No, it was for nothing. Really for nothing. The new tool has a big flaw, and I was saying how to avoid it and I was talking to thin air. Yeah well sometimes that happens too, you do things for nothing. Well take a break, but not too long of one, we need you around here. Thanks, Motoki. I'm just very very tired and am feeling a BIT too much like this project is my baby. LOL! Far too emotionally involved, indeed. One day you will be avenged...don't worry! I'm not lookin' for vengence. I like Quaxi. Sorry if it wsounded like I was to you. Last edited by RGiles : 14th Dec 2004 at 9:14 AM. I was just being silly. I know how frustrating it is when you try to tell someone something they need to know and they say yeah, yeah and then don't listen. Had the same thing happen to me at work today. Good luck with it, Jorenne. Just take it one step at a time. If you don't try to think of the whole project at once, each step is very easy in and of itself. That's the point, I think. We can't refer to our efforts as a "whole project", everyone just adds to the stack what he can. Sometimes we just move along different ways, but the goal is the same; no one is "right" or "wrong". Hope you regain soon your smile, RG. And NOW I'm going to read for the 4th time what you wrote about the sunflower plant... I'm not dumb, really :D, but sometimes following someone else's steps is more difficult that making them by myself. Last edited by numenor : 14th Dec 2004 at 11:30 AM. I wasn't talking about a flaw in the program, but a flaw in the process of getting people started on adding new multiple-texture options. This is the very wrong way to get people started on the process, and as I said, he put my name on it, and I am partially responsible for it. (And you're listed too ) I do not want to be responsible for people losing all their custom textures with a single click. That's what upsets me. I haven't yet tried out his tool on an object with multiple materials like the Sunflower. I should do that, because if it works right, it's the basis of the exact batch-generator we need to make this a safe process for everyone. 5) If everything works fine, I'll delete the new decors one by one to see what happens. The issue is that we want to be able to add new texture options to ALL exitsing objects in the catalog without having to create cloned packages for every item. I can do this just fine with a single item at a time. It's not too hard. Now the idea is to make a base package that will enable the multiple texture options on all of the objects, and distrubute that base package so everyone can use it to make as many new textures as they want. What we are afraid of is: what happens if I download your new poster and it conflicts with the one I have modded by myself? And, even if everyting goes fine, we wouldn't want, for instance, to have two "different" posters in the objects selector, each one with the base decor and 1 added decor: we'd like to "sum up" all the new downloaded decors into a unique poster in the object selector. Last edited by numenor : 14th Dec 2004 at 12:14 PM. Sorry, but I didn't notice this Thread before. So here is what i Will do, I'll take down SimPE 0.12q and set it back to 0.12p (only 100 downloads so far). Since this new SimPE version I just imagined new threads like 'HHHEEELLLLPPPP!!! My perfectly pink couch made my ghastly goth couch dissappear!' heh. Oh, and can we expect Bella Cubed soon? Oh and RGile, I didn't want to Ignore your suggestion but I simply wasn't aware of this Thread so please everyone if you have important Suggestions please send me a PM That's the only way to make sure I know about it.